We’re going on a relaxing vacation next week, one where we just rent a cabin to lounge beside a lake. It’s the best kind of vacation for hanging out with family, reading books and, of course, playing video games. 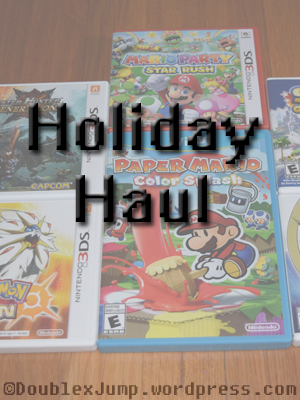 Aside from a suitcase full of books, our 3DS systems are always packed with plenty of games whenever we go away. I always tend to bring more games than I plan on playing. I never really have a specific game in mind when I go away, but I tend to bring as many games as I can. I mean, I’m not really a light packer anyway. I try not to pack too many, especially since we don’t take the cases for the games. Rather, the games all get shoved into a little Ziploc bag before going in the suitcase. I’m paranoid that I’m going to lose a game or two! That fear doesn’t stop me from always packing certain games, however. Whenever we go away, I need to bring one or two of my favorite Harvest Moon games. There’s just something about a relaxing farm game that goes hand-in-hand with vacation. Meanwhile, I always tend to bring a Pokemon game. I always plan on starting a new journey and beating the game before the week ends. That usually never happens, but one vacation I beat HeartGold from start to finish. I also tend to bring Pokemon Conquest, but I beat that a long time ago. I don’t know if I’ll bring it this time. Pokemon is another good franchise to bring. One of my old favorites that I used to bring all the time was Sonic Battle for the GameBoy Advance. It always had great replay value, because the little robot character could mimic moves from all the other Sonic characters, letting you customize its fighting style however you wanted. I don’t remember that game. I don’t think I’ve ever played it. But going off your Harvest Moon, Animal Crossing is a great game to bring as well. It’s calming and relaxing and the perfect thing to wake up and play right away. Harvest Moon and Animal Crossing do seem like the perfect vacation games, don’t they? When I want something with a little more adventure and strategy, though, I tend to reach for Fire Emblem. Awakening will probably be the one to come on vacation with us! There are also a couple of games that I’ve had for months but haven’t had the time to try playing them, like Monster Hunter Generation. I’ll have to bring that and give it a try! There are just too many games. In addition to these games, we now have the Nintendo Switch. We’ll see how much of our time is taken up by that. Which games do you bring with you when you go away? Let us know in the comments below! Happy first Tuesday of 2017! I can’t believe another year has come and gone. Last year, Kris and talked about what we hoped to get for Christmas and Santa did not disappoint. All of the gifts I received were either book/writing related, video game related, or Harry Potter related. Is it safe to say that my friends and family know me a little too well? Remember I was excited to get Charmander socks from that video game raffle basket? Well, I got more socks! I don’t think I’ve ever had so many socks in my life. 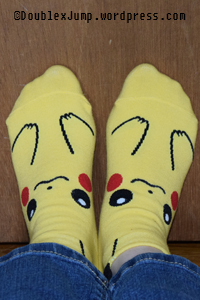 I now have nifty ankle socks of Charmander, Squirtle, Pikachu, and Psyduck. They’re actually pretty comfortable! I also got a book called Guy in Real Life by Steve Brezenoff which is based on a guy and girl and an MMORPG game. I’ve started reading it already and it’s pretty good! I also got a couple of T-shirts. I got a Pikachu one, a PeanutButterGamer shirt, and a super cool Ace Attorney shirt. Two of the shirts were from The Yetee, very soft and comfy, and the other one was from the Pixel Empire, which was also pretty soft. I really like the fabric on them. And, of course, I got some video games. 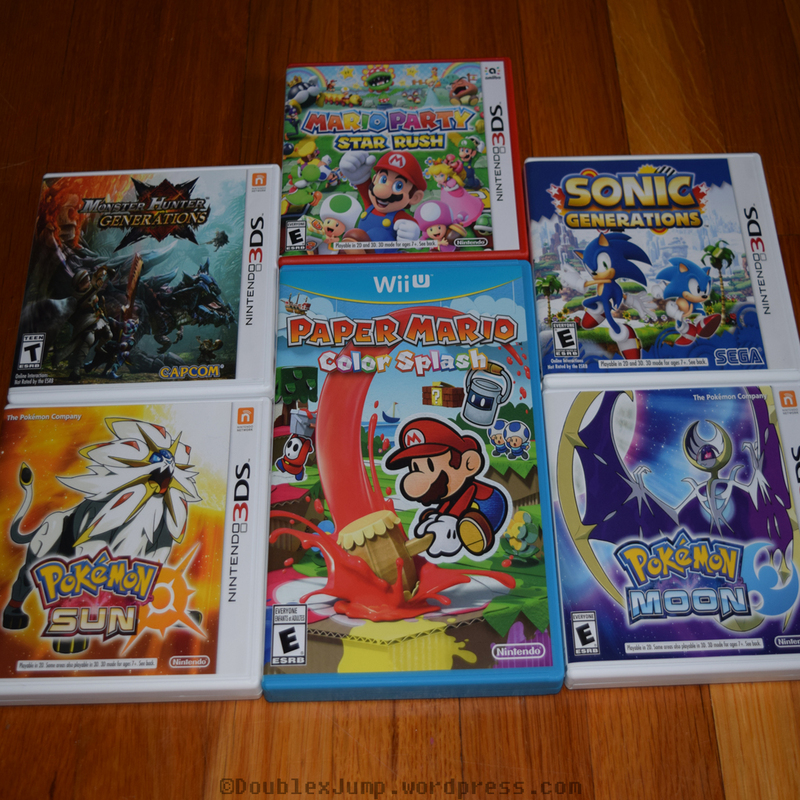 I got Pokemon Moon (I already have Pokemon Sun that I pre-ordered myself), Mario Party Star Rush, and Paper Mario Color Splash. Kris got Pokemon Sun, Monster Hunter Generations, and Sonic Generations. So, between the two of us we have a good haul of new games to play. I hope you all had a wonderful holiday with friends and family. I also hope you all had a great New Year. 2017 will be the year of games! Did you get any new video games for Christmas? Let me know in the comments below!